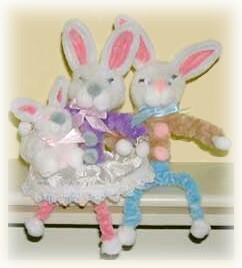 How to make an Easter bunny family from chenille stems and pompoms. Refer to the photo often for help in assembling this adorable little family! The diagram, at right, shows the assembly for the body. Refer to both the photo and the diagram as you proceed through the craft instructions. For the legs, fold one white chenille stem in half and twist together. Fold in half again. Repeat for the arms with a 10 inch length stem. Fold a 6 inch length of white chenille in half to make the centre of the body. Refer to photo for assembling the body of mom and dad. bit of glue to secure all the stems in place. Repeat this for Mom and Dad’s ears, making four ears in total. For the baby bunny, use a four inch stem instead and make two ears. To create the shirt and pants, simply wrap chenille stems around your original body stems until you have the desired thickness. I used only one fluffy chenille stem for the shirt and two regular stems for the legs. Secure Mom’s skirt in place with a little glue. Glue pompoms for the hands and feet, tie a bow around the neck of each bunny, add a little gold trim or ribbon to Mom’s wrist, glue ears in place and assemble face. Refer to the photo for placement of pompoms. For baby bunny, simply glue pompoms together as shown in the diagram, add teeny pompoms for the eyes and little buttons on his tummy. Tie a bow around baby’s neck and you are all done.